(7 mm) and centring cams on the upper deck. These centring cams on the top deck of the H1 pallet ensure that the Euronorm stacking bins of 400 x 600 mm can be centred in a stack. 4 stacks of Euronorm stacking bins 400 x 600 mm can be placed on the plastic H1 pallet. The H1 pallet can be supplied both new and used. The official pool version of the H1 pallet has a GS1 stamp, as prescribed by the European Trade Institute. With this GS1 quality mark the H1 pallet can be used within the European pallet pool. The H1 plastic pallet (with GS1 quality mark) has a weight of 18 kg for stackability and taring. The hygiene pallet H1 with safety edge and centring tabs on the upper deck is made of HDPE material. The temperature resistance of this plastic Euro pallet H1 Hygiene pallet is: – 40 degrees C up to + 70 degrees C.
Dynamic load capacity: 1,250 kg. Racking load capacity: 1,000 kg. We also stock, in addition, the plastic Euro pallet H1 RG. 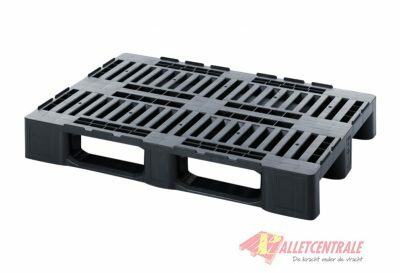 The dimensions of this plastic Euro pallet H1 RG are 800 x 1200 x 160 mm. The Hygiene H1 plastic pallet is heat and cold resistant. The pallet has a weight of 17.3 kg. 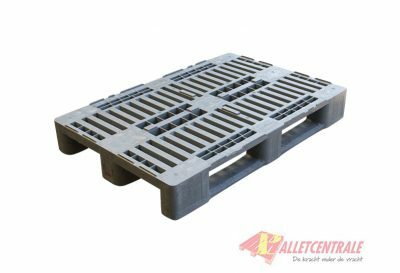 The plastic H1 pallet is made of regenerated HDPE and has 9 mm edges on the upper deck to ensure that the load does not slide. The empty pallets can also be neatly stacked without sliding. This plastic H1 pallet is ideal for packaged food. The temperature resistance of this plastic pallet H1 is from -20 degrees C up to + 50 degrees C.
Static load capacity: 5,000 kg. Dynamic load capacity: 1,000 kg. Racking load capacity: 800 kg.